Save money on your order! Get coupon codes and links to special offers for your fairy and unicorn personal checks. Use coupon code 25OFFPER at checkout. Use coupon code 4THBOXAF at checkout. Use coupon code 2BOXAF at checkout. Use coupon code 25OFFBIZ at checkout. 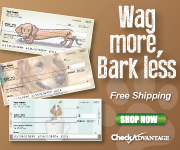 Buy one box of checks - Get one box of checks FREE! Save 50% as compared to traditional bank check prices! Use code 5DCP at checkout. 2nd box of checks only 10 cents when you use code 4K29 at checkout.